EvilInnocence is your source for quality Poser and DAZ Studio content. We have hundreds of products in our store, including clothing for numerous popular figures, sets and props, and our CrossDresser clothing conversion utility. In our store, we have a wide selection of content for Poser and Daz Studio. You can find clothing in various styles for many popular figures, including Vicky 4, Aiko 4, Cookie, and many others. We also have sets and props, original figures, poses, and our popular CrossDresser clothing conversion utility. We have a large collection of free stuff for Poser and Daz Studio. There is clothing available for many figures, full body morphs for many of our brokered products, as well as poses, and textures. 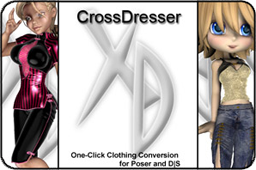 Our CrossDresser utility is an easy-to-use, high quality clothing conversion utility for Poser and Daz Studio clothing. With the CrossDresser, you can convert clothing from any of our supported figures to any other. We currently support over 100 figures, and more are added regularly. We also have a handful of other useful utilities, and plan to add many more in the future.